Chances are when it comes time to install a performance header, tear down that engine, add a turbo charger or just rebuild the head; your OE exhaust studs and nuts will be rusty, corroded, and nasty ...That is, if they haven't already fallen off or caused a leak. In any case, we offer our quality sets for your BMW. 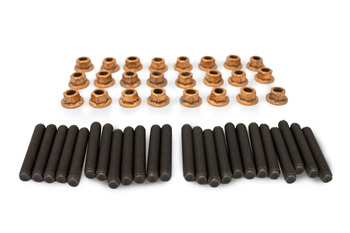 Included are Copper alloy nuts, high-grade studs, and all required misc. hardware required. This ensures that despite vibration, extreme heat, or age, your exhaust nuts and studs will not fail at the wrong moment. Inexpensive insurance for a job well done. From zach of cary, North Carolina on 1/15/2015 .